The ed in inspired can be a short abbreviation for education. Today’s focus is all about the ways we educate and are educated and the inspiration it provides. It is a look forward to sharing what we we have learned and a look backward to appreciate and realize the gifts and abilities that have appeared in the pursuit of wanting to know more. In the spirit of review, the gifts that appear in the ways that we become educated can often equal the education received itself. Allowing ourselves to find value, curiosity and become intrigued and engaged helps us lean toward an interest that inspires us. What we teach and/or share is what we are moved by, as it fills a purpose for us and often brings out our abilities to make a point clear. 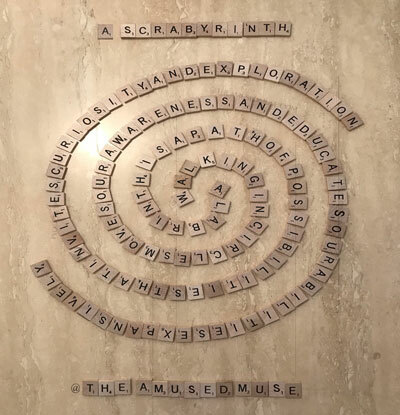 The poem of the 100 word labyrinth was an inspired creation on the 265th day inspired by the remaining 100 days in the year. The design of the five points of faith focus with a focus on the fifth cranial nerve was a creative design of the labyrinth inspired to help on the 246th day. Inspired to inspire others who are interested from an appreciative place of the world of creativity and contribution. Education continually offers us the opportunity to expand, improve and raise the quality of life, one inspiration at a time as inspiration continues to be a source of education.. Consider what more you know after your walking experience today and the engagement you put into to appreciate it. The labyrinth offers an opportunity to play with possibilities and inspire creativity. 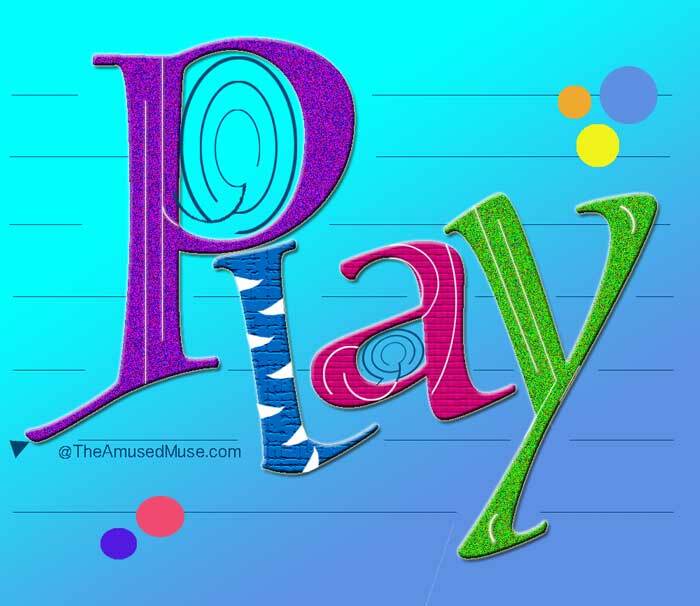 In your serious walk of today… add a little play and observe what comes your way. Begin with your favorite designs of the labyrinth or create your own. Add something to it like color, elements and/or different aspects to make them stand out and fit the week’s description in a way that you can relate to. Reshape, add or subtract elements of the design to make it fit what you want it to say. Enjoy discerning your expression. Make it fitting, honest and accurate in how it describes your experiences. Title it, add your artistic name and your location so we can see a world expression of the labyrinth taking shape. Share your designs with a simple description to interpret your expression for posting on this site. If you need Suggestions to help you find a weekly Expression, check our suggestion page. • It can be an opportunity or a challenge for you. • There is no right and wrong, only honest expression. • Don’t wait for perfection, act on impulse and feeling, that is where our expression comes. • Notice every time that you give of yourself, you become larger. • Do this alone or do this with others…. be creative! • We are not asking for personal names, only your creative cultivated name, so the world won’t know it is you; it will know your expression however. Be curious, research and share what you know of unique United States labyrinths, the people, the programs, the designs, the resources or simply the desires in the first half of the month and apply something that you find unique to your own life walk. Join us on the Mid Month Dialogues to share what you discovered, ask questions and hear from others about what they explored and discovered. Be inspired with a greater appreciation of what unites us with more impactful insight that brings our labyrinth connection in line with greater perspective in our year of living honestly. In the heart and art of celebration, a friend is just that. Today is the birthday of Laura, she is a joyous soul who’s creativity is inspired by service. She brings her human presence fully alive to the Midwestern Ministry she provides as a Pastor of a small church in Iowa. She is also a Master Trainer of Laughter like myself and together we have offered 10 annual conferences on the joy of living through laughter, playfulness and creativity. It is when we joined forces that the real fun began and I had opportunity to know this inspired individual even better. Fond of labyrinths, this one is designed and dedicated to her outrageous spirit. In her church, they laugh in the pews to recall their joyful spirit and whether she is in Ministerial robes of providing an amusing way to explain her sermon, a pink boa is not far away. So with a capital L for Loving, Living and Laughing out loud, it sits in the center for Laura who demonstrates to her parishioners, community, family and friends that it is ok to live out loud and beyond the box of conditioning. Happy Birthday Laura! Celebrate how you step out of the box and why you appreciate it. 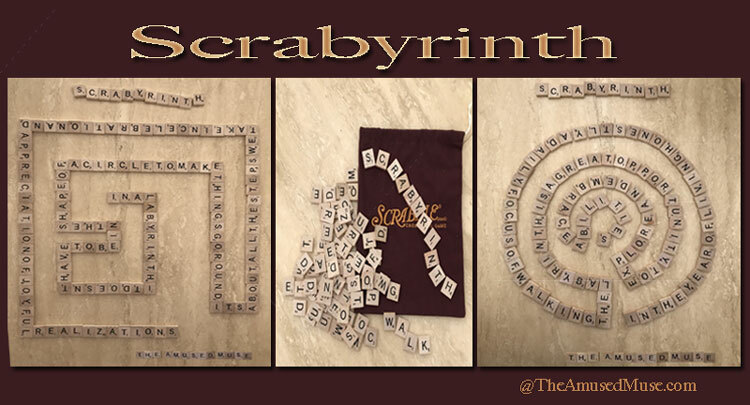 As the play with words continues on our scrabble message boards today, a number of expressions have come up that make the experience all the more enjoyable in creating designs with words and words of design. It seemed it would be a fun game to develop and so am putting together designs and ideas for something that could be educational and inspirational. With young students, it’s typical for us to create labyrinths out of a variety of materials that are on hand or with a greater intention, such as canned or boxed food for a food or gloves and mittens for a mitten labyrinth. Though with words and designs it can inspire something new. Walk with your favorite expressions of the labyrinth in quote, story or saying. Observe the ways in which you are that expression. Celebrating creativity with words became more enjoyable, appreciative and engaging with the new super Scrabble game I surprised Mom with on Mother’s Day. Since then, using the game to engage has invited a number of opportunities. Leaving the board on a table that is enroute to the kitchen, we each add to the game throughout the day and becomes a quick way to note her function, attitude and outlook for the day. In spilling a number of tiles on the kitchen table, they became sentences that led to designs that opened up conversations and uplifted the dialogue. Mom has become a bit of a designer too, learning the patterns of the labyrinth, she asks of their purpose and why they are significant. It’s easier sometime and often more fun and engaging on her part to follow the path for the message. Finding simple methods for interaction and engagement, we’ve made a number of designs and messages with our new Scrabyrinth. For Scrabble fans, the added note of fun is that if you start on the bottom, you’ll come out on top and there are 211 points here! Celebrate your words and observe how they fit into your walking design for more appreciation and realization today. The tabletop labyrinths I have designed and created were inspired by my desire to walk the path in winter, when the wooded path is buried under 3 feet of snow. I walk my original tabletop path often and have another one I love to walk that was made for me by my daughter. I’ve given a few to friends, including a bling coworker, and sold one made of pine needles and branches. When I facilitate a walk I often offer walkers an opportunity to complete a craft to take home with them as a reminder of their time on the path. Sometimes it’s a pin, at others it’s a mandala, or a smaller path to keep with them to walk whenever they need a lift. 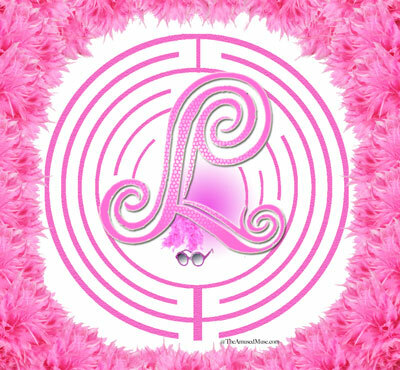 During this relaxing, open time, participants are encouraged to share insights about their labyrinth walk experience. Celebrating the winter for its creative inspiration, celebrating the offerings to others, and celebrate the experiences created and the take away reminders. Celebrate where your creativity comes from, what you give and what you receive from the inspirations and appreciations. Today the strands of life came together through a collaboration of cosmetologists. 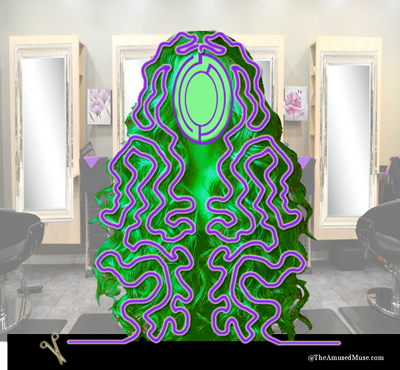 Arriving at my daughter’s salon, the idea was to trim up a few loose ends and in the conversations and chatter, the labyrinth weaved its way from brain to scalp. The process and procedures of styling were standard, though being Mom, special treatment meant a few extra perks and a bit more time in the affair of the chair. Time to doodle with affect of the surrounding wall images of ravishing locks, the observance of the threads and strands in their natural and somewhat unnatural order moved circular, straight and altogether redistributed. Each fun follicle emanated from a central point and with a variety of stylized directions maneuvered in such a way as to meander until it found its completion among others. From a bottom’s up perspective one might find the intrigue begins at the ends and moves to a central point with a reflection from before to after. A look at some of the designs of coif and couture and it is not surprising to find a labyrinth affair of hair so purposefully appreciated. Perhaps in this amusing way, the labyrinth can remove all the twisting, twirling and teasing with a little straightforward insight. In the honesty of a hair style we might discover some of our greater features that bring us to take things a little less seriously and be INspired by our natural creativities to play with what is available. Weave your way onto the path today noticing the strands in each path and how they each are part of the whole. Let this month unfurl your creativity, spontaneity and jocularity. It feels good to feel good and while we have been conditioned to shush our good times, let the labyrinth be our own private creation station of amusement, enjoyment and playful experiments. This month educate with amusement and see how much farther you get. Have fun and be creative. We have three opportunities to education your potential with amusement this month that involves either your personal walk, your ability to design and how much you can learn by sharing. On your Mark, Get Set…Go! 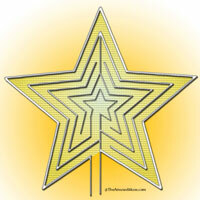 In the 30 days that grace this month, play with the way you personally experience the labyrinth. Let this season of education be one of personal bests and enjoy finding a new way to be innovative, creative, inspired and amused in your personal experiences. I’d love to see what you come up with! Please share your wonderful experiences! To date I have created 95 different labyrinth creations and designs since the beginning of the year, let that inspire you to create something new this month that is inspiring and firing for your imagination. Einstein said that playing with ideas was the highest form of research and this is an education for all of us. As you walk in new ways, share your designs as I have done with mine last year and this. Perfection isn’t what we are after, amusement is! I look forward to seeing what you come up with! I will toss out lots of inspiring ideas… stay tuned daily. Share away and become a glad designer instead of a mad one! One of the best ways to learn anything is having to teach or explain it to someone else. Whether you facilitate others, teach or simply share with a few, spend the month discovering amusing new ways to help others get more out of their walk with a lighter attitude and a more earnest enjoyment in what you share. Anything you want to know more about, share and this month share with a fun flair and notice how much more you actually begin to understand. You just might find a side of yourself forgotten. To receive all that, be a great giver. Today was a day of hearing too many no’s, too many worries and too much of what won’t work as opposed to a more natural focus on what does. To this individual who’s made a living on bringing to light what works, what’s right and what is natural over normal, hearing too much in the opposite direction can drive an urgent focus on creativity to restore the balance. It became a YES day and surrounded by a world of No’s, a design came to mind that developed a labyrinth that might take a while to matriculate to allow the time to remember and redirect a focus to one that isn’t just positive, it can be a more effective and efficient way to do everything. One can be reminded through the 40 labyrinths of NO before embarking upon the YES and the seven other NO‘s that are found among the YES that all the NO is essential often to find the value of the YES. Sales people are often told to achieve and appreciate the NO as it can be instrumental in defining the nature and behavior of the YES. 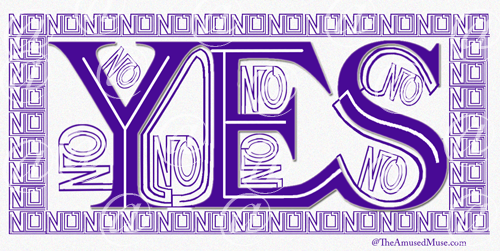 For those light hearted enough to play with the NO, turning each one into a YES can provide a wealth of understanding and insight to elevate our human condition. Amuse yourself with the No’s in your life or of this day. Walk with the easy one’s first and in your steps discover the value of each NO and how it leads to a YES. While April Fool’s Day was five days ago, Chicago has weather tricks to keep us fooled all year long. It is the land of wait five minutes…. and we can know a whole new season. Today’s surprise snowfall then really isn’t all that much a surprise, yet it still fools us as we begin to feel the entrance of Spring. Knowing that it won’t last long and become a distraction, it is amusing to watch the shifts and love the surprise. Walking outside in sandals was a bit presumptuous, though happy that boots were in the car. 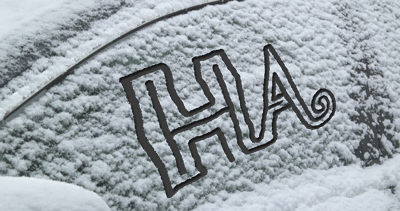 As the car warmed up, the clearing of windows began and in that clearing… there was a bit of fun. Playing with our days can create such creativity that problems can soon become something we look forward to exercising into solutions and ah ha ha ha moments. Take a problem into the labyrinth today, play with the possibilities each turn provides as a new perspective and see if you don’t find something that is more honest in the answers you develop. 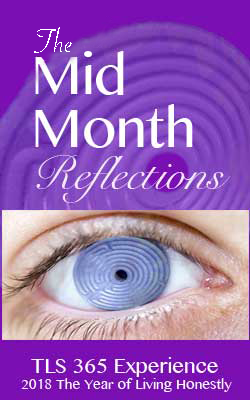 As we move from mid month into the second half our focus after our Monthly Dialogues tends to raise consciousness to take what we explored in the first half of the month of realization to expanding, deepening and enjoying the value of each experience that comes with the wisdom of what was gained. That is what this month’s focus of Realize and Surprise is all about. Surprise yourself in this last half with what is possible by going a little farther, looking a little deeper or enjoying another aspect of this month that is an awesome appreciation in the study of spirals; math’s moving magical mystery. Today was a writing day and in going a little farther, even our words can become a spiral of purpose and practicality that move us into the point. The design created today was a direct result of the direction the words inspired. What words spiral you into deeper insight? As it is now the third month of the year and our last month of growing awareness before we delve into the ways of education, allow this month be one that creates both the light hearted discovery and profound realization. How can you create more awareness with the labyrinth personally or in the ways you share with others? Where do you notice a spiral effect that takes you to the point or away from it? Be on the lookout for the spiraling nature this month. 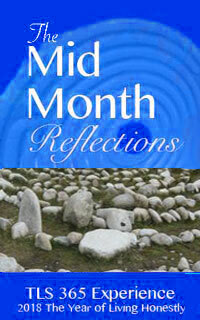 In the 31 Days this month offers, become aware of the daily realizations that you create and discover. Walking daily creates compound interest in what you look forward to and discover each day. Let March become your month of expanded capacity as you walk to make each day and adventure in exploration of what more you can explore. Seek to spiral into new and inspiring realization and whether it is rich and profound or light hearted and amusing… be open, walk with intention and you are bound to come away larger. One can realize and find much in the depth of understanding that awareness offers us, though when we look forward to realization of that depth and awareness, it can inspire new ways of appreciation and discovery in both our process and capabilities as we are constantly growing, no matter what age. Invite the element of surprise into what you realize as it can lift what you discover into seeing a bit more than before. Notice the spiral effect of how you move from realize to surprise and make discovery more significant and true.